Free Shipping Included! Iridium GO! 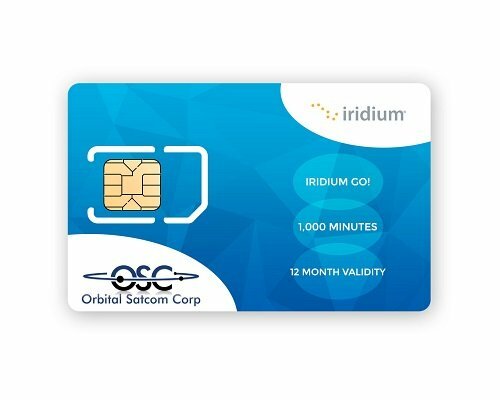 Prepaid SIM with 1,000 Data Minutes by iridium at All Company Mobiles. MPN: NA. Hurry! Limited time offer. Offer valid only while supplies last. 1000 minutes of prepaid Iridium airtime for your Iridium satellite phone or terminal. This card offers 365 Days validity from time of activation. 1000 minutes of prepaid Iridium airtime for your Iridium satellite phone or terminal. This card offers 365 Days validity from time of activation. Minutes can easily be added or validity extended with an email or phone call to APOLLO SATCOM. This card allows top-ups. Any remaining minutes still on the card will rollover when new minutes are added and be added to the new minutes. When minutes are added, the validity period will be extended by the duration of the new voucher starting from the expiration date of any previous minutes on the card. If you already have an active SIM card with APOLLO SATCOM, these minutes can be loaded to your SIM card. Minutes do rollover if still in the validity period. (Only Select SIM Cards) The $35 SIM Iridium SIM Card activation fee is waived. In order for this airtime to work with your satellite phone, an Iridium Prepaid Worldwide SIM Card issued by APOLLO SATCOM is required. This card will work anywhere on the planet on Iridium's pole-to-pole satellite network. Whether you're in Antarctica or California, you will get the same airtime price and the same quality of service. Worldwide Minutes / USE ANYWHERE!